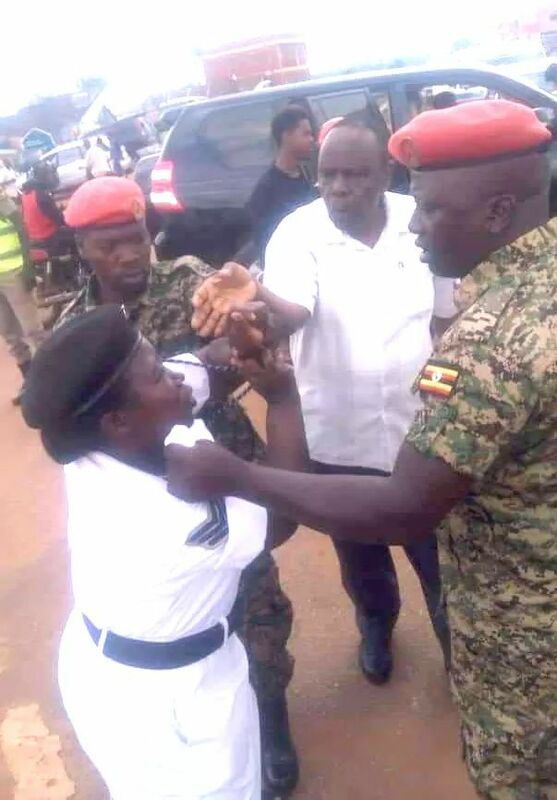 KAMPALA – Following the video clip that circulated on social media over the weekend, in which a traffic officer identified as Esther Namaganda was assaulted by Uganda’s Ambassador to Burundi Maj Gen Matayo Kaligonza and tow Uganda Peoples Defense Force (UPDF) officers also bodyguards to the NRM Historical, NGOs have raised red flag. UPDF spokesperson Brig Richard Karemire said the soldiers who were seen in a video assaulting a female police officer were arrested. Although many have condemned UPDF for arresting the errant officers, Dr. Livingstone Sewanyana, Executive Director Foundation for Human Rights Initiative has lashed out to UPDF authorities questioning the selective application of the law. “It is not only the bodyguards that were involved even Maj Gen Kyaligoza was involved. Therefore, the law must equally apply to him. There should be a selective application of the law,” Dr. Sewanyana said. “He should be held accountable and disciplinary action should be taken by the highest appointing authority against him because he does not serve as a good example of a disciplined officer who is ready to respect the law and respect others,” He added. This website established that the two officers currently detained at Makindye Military barracks are Lance Corporal Peter Bushindiki and Private Okurut John Robert who appeared in the video holding trafficker officer Namaganda by the neckline of her uniform. Mr. Karemeire regretted the unfortunate incident and extended apologizes in a tweet. Dr. Fred Senkindi, a human rights defender and also the head of Research and advocacy has no reason to agree with Dr. Ssewanyana. He says the NGO will make sure Maj Kyaligonza pays for his impunity. “It is important that we respect the rule of law. It is important that every person regardless of their position is made answerable to the purported crime or incident. It is not right for junior officers to be arrested and charged and for their commanding officer whose instructions they were acting to walk away scot-free,” Dr. Senkindi said. The human rights activists argue that for the security agencies to encourage rule of law, the courts of law ought to alert the public about what sort of punishment is given to the law offenders. The act of alleged assault has since received wide condemnation. The speaker of Parliament Rebecca Kadaga said the “conduct is unacceptable for a leader”, and asked the Uganda Police Force Inspector General of Police Okoth Ochola to promote Officer Namaganda.